Is the unthinkable possible? Could the euro collapse? According to retired hedge fund manager, George Soros, it’s very possible. Don’t let the word “retired” fool you. He may not be managing money for clients anymore, but he remains very active with his own investments, which were recently estimated by the Forbes 400 List of Wealthiest Americans to exceed $22 Billion!! This staggering sum ranks Mr. Soros as the wealthiest (ex-) hedge fund manager in the world (the next closest is John Paulson at $15.5 Billion. Remember him? The one who shorted billions in sub-prime mortgages prior to the Bear Stearns and Lehman collapses). Forbes also claims that Mr. Soros is the 7th wealthiest American. John Paulson ranks a “mere” 17; Carl Icahn, 25. So when someone of Soros’ caliber says that the euro is in real trouble, stand up and listen. The repercussions could be even more severe than the Lehman bankruptcy. Don’t believe me? Read his most recent analysis here (http://www.nybooks.com/articles/archives/2011/oct/13/does-euro-have-future/). 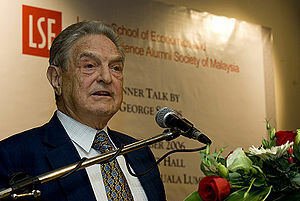 And a followup interview here http://www.businessinsider.com/soros-euro-crisis-to-trigger-breakdown-meltdown-global-financial-system-2011. Raul Larios is currently serving as Accounting and Finance Manager at Accion the U.S. Network — the largest non-profit lending network to small businesses in the United States. Accion connects small business owners with the financing and support it takes to start and grow healthy businesses. DISCLAIMER: The posts and comments on this blog are personal opinions that are shared for discussion purposes only. They are NOT to be construed as financial, legal or investment advice. PART 2 – Should Nonprofits Strive to be Profitable? Should nonprofits strive to be profitable? PART 1. Will Changes in N.Y. Non-profit Laws Cause Board Resignations? Is Fraud at Non-profits Significant? Are U.S. Nonprofits with Operations in Latin America Subject to FCPA? Want to Invest in Honduras? Tread Carefully! New Yorkers…how safe is your cooking gas? Did Walmart CEO Know of Mexican Bribes? Will longest waterfront park in the U.S. survive? Will Fracking Be Approved in New York?